File Security Protected ransomware uses sophisticated techniques to infiltrate computers and hide from its victims. Use Reimage to determine whether your system is infected and prevent the loss of your files. What can File Security Protected virus do to your computer? How did this malware conduct system infiltration? Can I fix my system by conducting File Security Protected removal? File Security Protected virus is a crypto-ransomware  that has been reportedly infecting computers and encrypting victims’ personal files stored on them. Please note that you may already know this virus as Fake WindowsUpdater or FakeWU ransomware. We have already talked about it in one of our previous articles. Since this ransomware has no specific name given to it by its creators, the users and malware researchers have thought of their own ways to call it. Both of the names stem from different aspects of the malware. In particular, titles of the malicious executable and the ransom note pop-up window. File Security Protected stands for the latter. 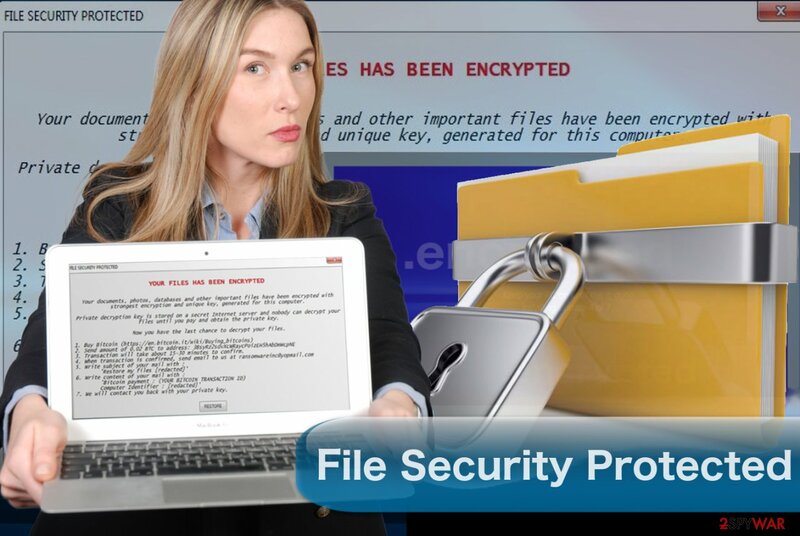 When the ransomware is done encrypting files, it automatically opens up a pop-up window, titled “File Security Protected” which contains information about what happened to the system and instructs the victim what to do in order to recover the encrypted files. According to the note, the victim has to pay a 0.02 Bitcoin  ransom, and they will receive a personalize decryption key. No matter what the extortionists may offer, do not collaborate with them and remove File Security Protected from your computer right away. You can’t possibly tell what the virus creators are really up to. Perhaps they are not even planning on sending you the decryption key and are only waiting for you to pay so they can simply vanish with your money. Anti-malware software such as Reimage can help speed up the elimination process and make sure no malware components are left on your computer to continue messing up your system. For those concerned with malware technicalities, it might be interesting to know that File Security Protected ransomware uses an AES-256 encryption algorithm  to render files unreadable. This particular ciphering technique often applied in ransomware development since it proves virtually uncrackable. In addition to the enciphering, this ransomware also appends files with “.encrypted” extensions which appear at the filename endings. These extensions will not disappear unless the victim pays a ransom and sends payment credentials to the indicated email address, ransomwareinc@yopmail.com. As you would not drop your money into the trash, you should not pay the extortionists either. Concentrate on File Security Protected removal instead. Though this will not help you recover the encrypted documents, your device will not be exposed to destructive software anymore, and you will be safe to create new data on your computer. In case you desperately need to get some of your files back, you will be able to do that following recovery guides provided just below this article. File Security Protected is nothing short of a sneaky parasite. It typically enters computers via infected email attachments . Currently, the malicious executable is concealed under a supposed Word file called Transaction-Report.docx. Upon downloading this document, the victims cannot see the .exe extension at the end, so there is not much that could trigger suspicion. Once this file is deployed on the computer, it connects malicious servers and finally downloads the File Security Protected executable on the PC. This file can then start executing data encryption. What you can do to prevent yourself from encountering such cyber infections is refrain from opening and downloading suspicious email attachments. Also, you should carefully select what websites you are visiting and what software you are downloading, because unsafe domains are a perfect ground for ransomware distribution. To protect your files from such unexpected incidents, you should also keep a backup of your files stored in some secure location . File Security Protected removal won’t solve all the problems that the malware provokes on your computer. The encrypted files will remain in their unreadable state, and the .encrypted extensions will not disappear automatically. Nevertheless, it is absolutely crucial to remove File Security Protected virus from the infected computer so that the system could function like it’s supposed to. Besides, without proper malware elimination, you will not be able to take up data recovery, so that’s another reason to get started with the elimination right away. Log in to your infected account and start the browser. Download Reimage or other legitimate anti-spyware program. Update it before a full system scan and remove malicious files that belong to your ransomware and complete File Security Protected removal. When a new window shows up, click Next and select your restore point that is prior the infiltration of File Security Protected. After doing that, click Next. Once you restore your system to a previous date, download and scan your computer with Reimage and make sure that File Security Protected removal is performed successfully. Guide which is presented above is supposed to help you remove File Security Protected from your computer. To recover your encrypted files, we recommend using a detailed guide prepared by 2-spyware.com security experts. If you are planning on carrying out File Security Protected recovery, the first thing you should try is running Data Recovery Pro on your computer. This tool is known to fix damaged files, so it might be successful in rolling back some of the data encrypted by File Security Protected ransomware, too. The tutorial below will explain how the ShadowExplorer can be used to recover encrypted files. Please keep in mind that this method relies on the state of the Volume Shadow Copies: if they have been corrupted or destroyed by the virus, it will not work. ^ What is crypto ransomware?. TheMerkle. Technology news and education. ^ Chris Hoffman. How to spot a dangerous email attachment. MakeUseOf. Technology, Simplified. ^ Wes Simons. How do I back up my data?. PCworld. News, tips and reviews from the experts on PCs, Windows, and more. This entry was posted on 2017-04-11 at 02:05 and is filed under Ransomware, Viruses. You can quickly scan the QR code with your mobile device and have File Security Protected ransomware virus manual removal instructions right in your pocket. How did you remove File Security Protected virus?